Several years ago when I was working in a middle school (4th-8th graders) I found myself B O R E D in my therapy sessions. If I was bored, I am SURE my students were too, so I started getting more creative in my sessions. In addition, I was needing activities that would target MANY DIFFERENT goals at once! Antonyms! Synonyms! Grammar! Following directions! Social skills! And then it hit me. Jeopardy! In Jeopardy, there are many different categories of questions, which was essentially what I was looking for. So I made myself a Jeopardy board and let me tell you, my students LOVE IT!! What I do, is develop categories of questions based on my student’s goals. 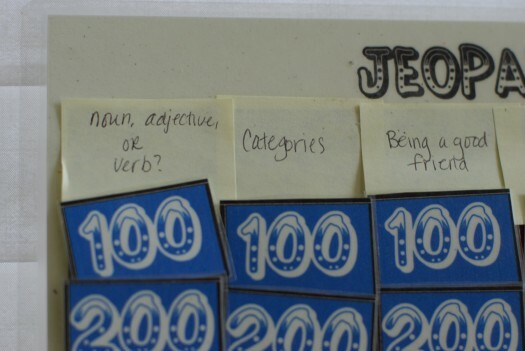 For example, I had some kids working on parts of speech, categories, and social/pragmatic skills. So I made up 5 questions under different categories and typed them up. I also included a topic of interest for one of my students with Asperger’s syndrome (spiders) to help motivate the child to participate. It worked!! She was THRILLED to see that as a topic! I made mine in WORD and then printed it out, laminated and used velcro to attach the numbers. I know there are now many similar games made for Power Point these days as well. Have fun! Thanks! I know you could make one on PPT but when I made this (5 years ago?) I never used the computer in sessions! I may need to get yours! 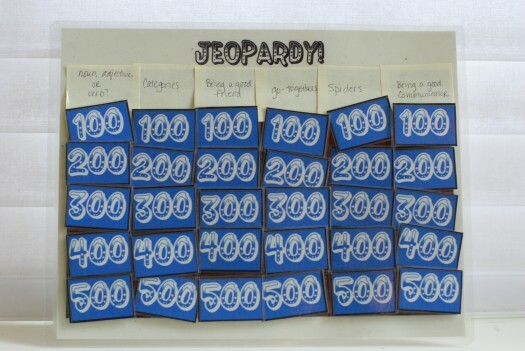 You can also make Jeopardy games on Quia (www.quia.com) to use on your computers. Just sharing ideas with you. Ah yes I have heard of Quia. If I used my computer in therapy more it would be a great idea! Thanks for sharing! I love your website and your ideas! I would love to use the game with a 7yr old I am currently working with. Could you send me some of the questions you used with your kids?